New to this year’s Festival, TO DO Tours offer festival attendees the unique opportunity to explore recent architectural projects around the city through designer-led tours. With a focus on our 2017 theme of ‘Living Well’, the projects chosen speak to the intersection of design and well-being from both public and private perspectives. TO DO Tours: Regent Park explore three important structures in Regent Park: the Regent Park Community Centre, Daniels Spectrum, and the Regent Park Aquatic Centre. 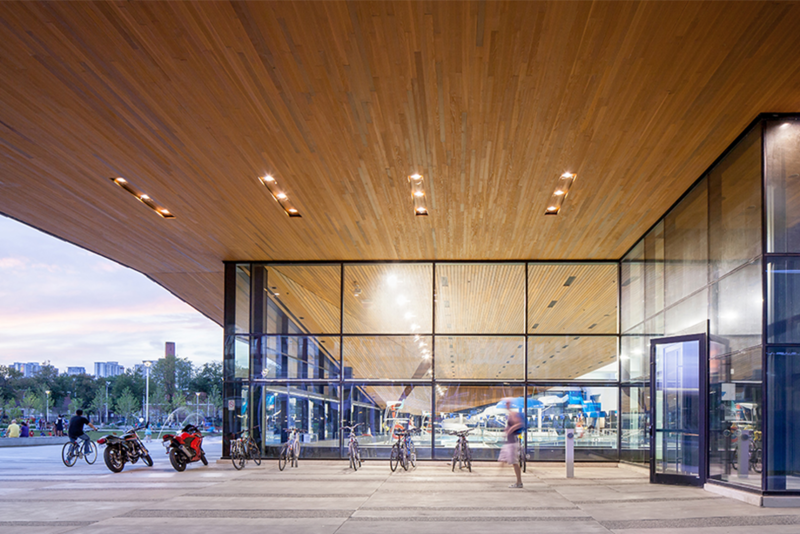 The Regent Park Community Centre, designed by CS&P Architects, is a community hub offering neighbouring residents employment services, a recreational facilities, and a community green roof for urban agriculture. The design features an internal courtyard surrounded by a ‘necklace’ of linked amenities. It has received recognition for its beautiful design, and role it plays in reinvigorating Toronto’s Regent Park community. Daniels Spectrum, previously the Regent Park Arts & Cultural Centre, was designed by Diamond Schmitt Architects and houses performance, rehearsal and community space for artistic, cultural and social innovation organizations. The space brings greater access to amenities in the area by creating connections and social hubs in an area that was previously lacking. The Regent Park Aquatic Centre is a multi-purpose swimming pool facility with multiple aquatic features. The centre, which was designed by MJMA Architects, replaced an outdoor pool and was created with a focus on transparency and a connection to nature. It has an open base and a ‘dorsal fin’ of aquatic hall sky lighting. The building also features a Green Roof which is integrated with the park surroundings. TO DO Tours: Regent Park offers attendees informative exploration of these public facilities that create community health through arts and recreation. The tours will be led by architects from CS&P Architects, Diamond Schmitt Architects, and MJMA, providing insightful detail of their work designing the spaces around them. Tours are free to join but space is limited, so be sure to sign up.